Constellation Argo Navis the Ship, is a southern constellation below constellation Hydra and above constellation Columba, with constellation Canis Major to the west and constellation Centaurus to the east. Argo spans 120 degrees of the Zodiac from the Signs of Cancer to Scorpio, and contains 18 named fixed stars. 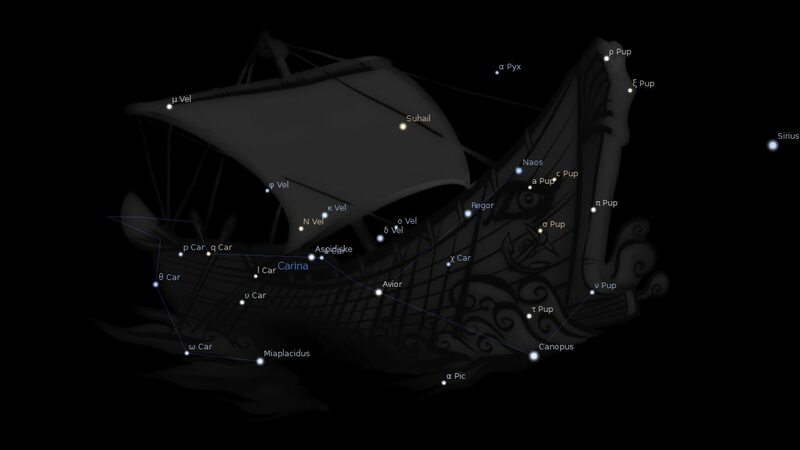 Being such a large figure, the Ships has been divided into 4 separate constellations, being Carina the Keel, Puppis the Stern, Vela the Sail and Pyxis the Compass. Argo Navis, the Ship Argo, generally plain Argo, lies entirely in the southern hemisphere, east of Canis Major, south of Monoceros and Hydra, largely in the Milky Way, showing above the horizon of New York city only a few of its unimportant stars; but it covers a great extent of sky, nearly seventy-five degrees in length, — Manilius calling it nobilis Argo, — and contains 829 naked-eye components. The center culminates on the 1st of March. …recent astronomers have subdivided the figure for convenience in reference, and now know its three divisions as Carina, the Keel, with 268 stars, Puppis, the Stern, with 313, and Vela, the Sail, with 248. La Caille, moreover, formed from stars in the early subordinate division Malus, the Mast, Pyxis Nautica, the Nautical Box or Mariner’s Compass, and this is still recognized by some good astronomers as Pyxis. The Ship appears to have no bow, thus presenting the same sectional character noticeable in Equuleus, Pegasus, and Taurus, and generally is so shown on the maps. Mythology insisted that it was built by Glaucus, or by Argos, for Jason, leader of the fifty Argonauts, whose number equaled that of the oars of the ship, aided by Pallas Athene, who herself set in the prow a piece from the speaking oak of Dodona; the Argo being “thus endowed with the power of warning and guiding the chieftains who form its crew.” She carried the famous expedition from Colchis in Thessaly to Aea in Colchis, in search of the golden fleece, and when the voyage was over Athene placed the boat in the sky. This is the celebrated ship of the Argonauts, of which HOMER sung nearly ten centuries before Christ. Sir Isaac Newton puts the expedition of the Argonauts shortly after the death of Solomon (about 975 BC). While Dr. Blair’s chronology puts it at 1236 BC. This is the return of the great emigrant-ship (Argo) and all its company of travellers (for this is the meaning of the word Argo). These are the words of an astronomer who knows nothing whatever of our interpretation of the heavens which is set forth in this work. It will indeed be a large vessel, the true Argo, with its company of travellers, “a great multitude which no man can number.” All this is indicated by the immense size of the constellation, as well as by the large number of its stars. There are 64 stars in Argo (reckoning by the Britannic catalogue); one of the 1st magnitude, six of the 2nd, nine of the 3rd, nine of the 4th, etc. Only a small part of the ship’s poop is visible in Britain. 1. 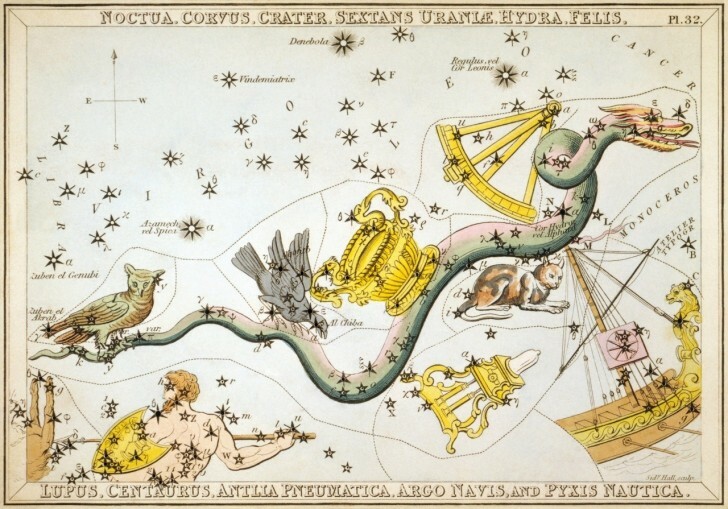 Fixed Stars and Constellations in Astrology, Vivian E. Robson, 1923, p.30. 2. Star Names: Their Lore and Meaning, Richard H. Allen, 1889, p.65-67. 3. The Witness of the Stars, E. W. Bullinger, 38. Argo (the Ship).